Looking at the EW cards you would prefer to be in 3NT as opposed to 4 , especially since the latter contract is defeated ‘on the go’ by a club lead. Even those who were playing transfer responses, enabling West to be declarer, had no real chance in the heart game. North led the 2 and South won with the ace and switched to the 10 for a rapid two down. North led the 2 and declarer took South’s ten with the king and returned the three, unblocking the jack under North’s ace. The diamond return saw declarer take South’s king with the ace and play the 9. North won and played a second diamond so declarer took ten tricks and 13 IMPs. To have any chance of defeating 3NT North must lead a diamond. 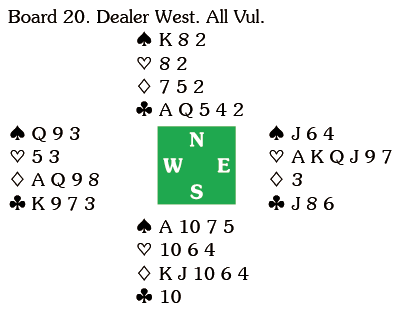 On this deal South had two chances to double diamonds – the first when East responded 1 , the second when East rebid 2 . The second opportunity is perhaps the best one, as partner will know it is purely lead directing. 48 pairs failed in a heart contract -many of them were in only 3 . 34 pairs made 9 or more tricks in 3NT. Could anyone find the diamond lead? Looking at the results I discovered that three declarers had been faced with the lead of the 2. One was in the match between Seligman and Casperson, where Jovi Smederevac had led the 7, another in the encounter between Vytas and Vegas Strong, where Andrey Gromov led the 2. Luckily the third example came from one of the matches being covered on BBO. South took advantage of the opportunity to double the artificial 2 . North led the 2 and when South played the king declarer won with the ace and ran dummy’s hearts. On the fourth round North discarded his remaining diamond, which might have been fatal. 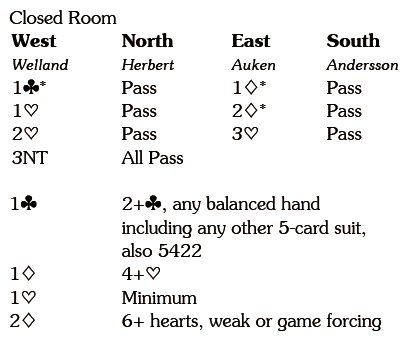 If declarer discards two diamonds on the last two hearts and then plays a club to the king, the defenders will be forced to surrender a trick in a black suit. 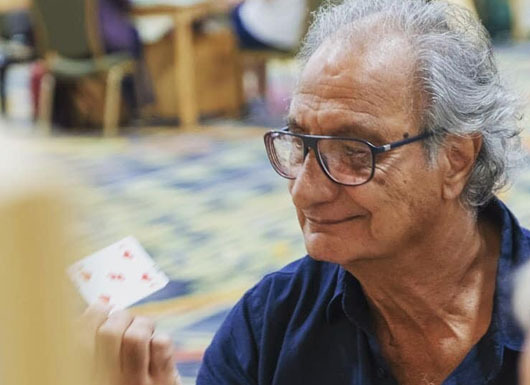 However, declarer pitched a club on the fifth heart and when he eventually played a club to the king North could win, cash the K and the Q and play a spade, South taking the ace and getting a diamond trick at the end. In the other room East was in 4 and was quickly two down when South led the 10.